The equation “Awareness + Action = Social Change” calls on communities to be an active part of ending gender-based violence. The "Awareness + Action = Social Change: Strategies to End Gender-Based Violence" infographic introduces this formula to end gender-based violence, offering key illustrations and talking points to communicate this message to a wide range of audiences. 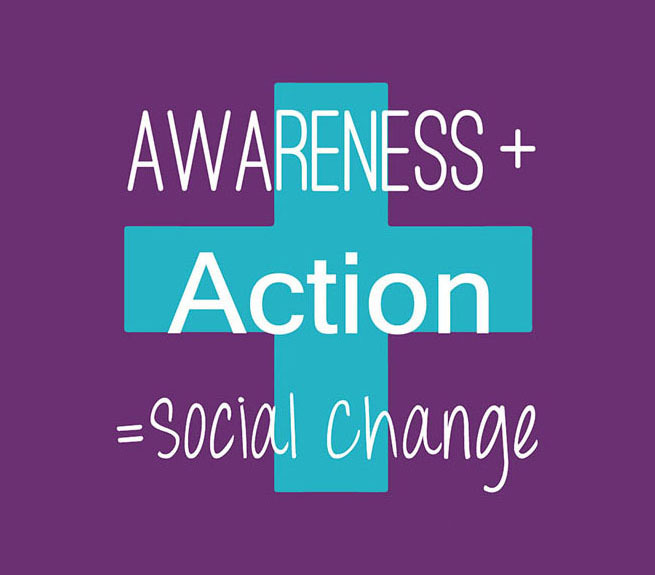 ​​​"​​​​Awareness + Action = Social Change: What’s your one thing?" describes the process of moving people to collective action to advance social change during Domestic Violence Awareness Month and Beyond, starting with one thing. Examples of concrete action steps are provided. This message introduces a prevention component to domestic violence awareness efforts, emphasizing that to accomplish real social transformation, we must incorporate concrete action steps that individuals, families, communities, and institutions can take to promote safe, healthy, and thriving environments for all. Download the infographics from VAWnet for use in domestic violence awareness and prevention efforts. Also check out the DVAP website and the Three-Legged Stool Talking Points Form: Is Domestic Violence Preventable?